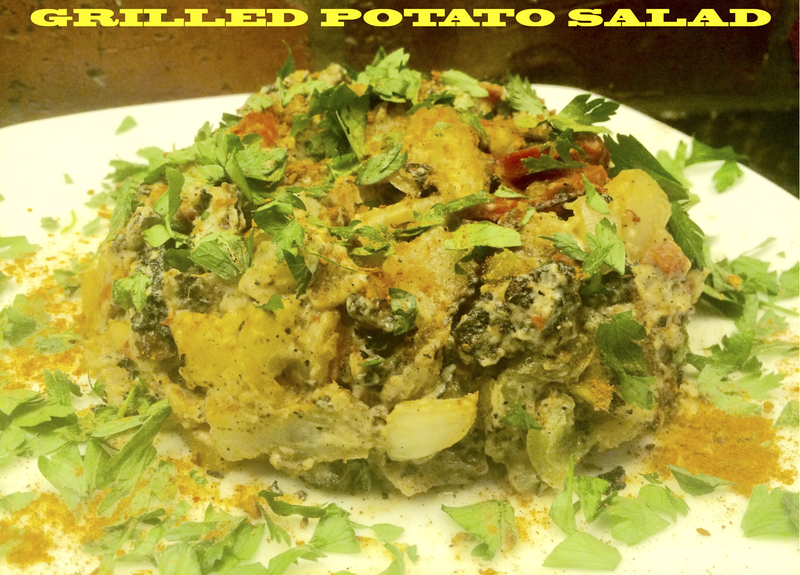 Skin-on Grilled Potato Salad with chopped Fresh Parsley, Grilled Bell Peppers and Onions offers more Nutrients than the typical Boiled Potato version; Mayo and Mustard are Optional. Potato Salad seems to be a staple on the Menus of many cultures, from all across America, to Asia and throughout Europe. It is great paired with Grilled Foods like German Sausages, as a side dish with Korean BBQ and of course with American Barbecued Chicken and Ribs. Though Potatoes are not considered the most nutritious vegetables, they are known to be be much healthier served skin-on. Another advantage to Grilling vs. Boiling is they tend to retain more nutrients. I first thought of doing Grilled Potato Salad while in the process of experimenting with Grilled Potato “Fries”. Having a few extra disks of crispy, perfectly grilled potatoes, I diced them and shared them with a restaurant neighbor who added a delicious dressing and fresh Herbs. Adding natural Wood Smoke takes this Grilled Salad to a new even more delicious dimension. I recently served the dish at a Birthday Catering in the park for a very special 1 Year Old and 130 of her closest Family and Friends. We caught some of it on video. 1. Get your Gas or Charcoal Grill Smoking before you start Grilling. See: SMOKING USING WOOD CHIPS AND CHUNKS. 2. Wash and Slice Potatoes 1”-1 1/2 inches thick, lengthwise leaving skin on (may remove any blemishes). 3. Marinate Potatoes evenly in wet mixture of 1/2 Cup Dressing, 1/4 Cup Parsley and BBQ Dry Rub (click for Recipe). May reserve 1 Tbsp Parsley for Garish and a sprig to decorate on the side. 4. Grill Potatoes on Medium parts of Grill, flipping after 10 Minutes, checking if some pieces are cooking faster than others. Keep Smoke going on throughout. 5. Slice Onion 1” inch Thick. Cut Peppers lengthwise in Half, seed and soak all in Leftover Marinade from Potatoes. 6. Grill Peppers and Onions up to 10 Minutes per side, or until tender. 7. Once all veggies are cool enough to handle. chop into 1”- 1 1/2” inch Dice. Toss in bowl with up to 1/2 Cup Dressing, Mayo and Mustard to taste. Add more Rub and Salt/Pepper to taste. 6. For serving, sprinkle plated Potato Salad with more Parsley and BBQ Rub. May add a sprig of Parsley on side for decoration. Enjoy. Spread Potatoes evenly over Grill, top shelf OK. Leave space in between for circulation. Grill Potatoes evenly, for 10 Minutes per side. If a few get a bit crispy, even better. Tray of Grilled Potato Salad, garnished with Parsley ready to serve for Catering.